Here is day 4 of the vigil for Pastor Saeed. This is from the Facebook page. 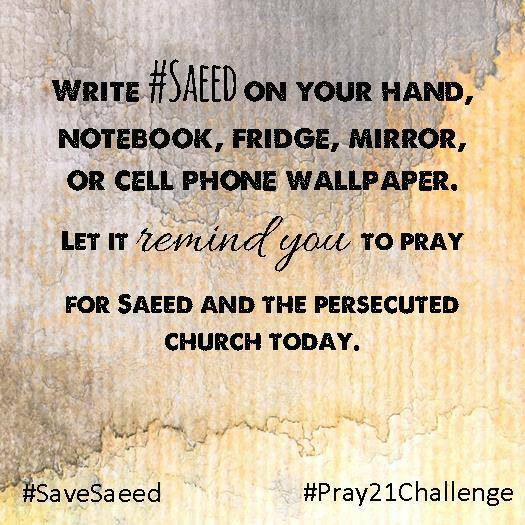 Pastor Saeed is in prison because of his faith in Jesus Christ. I didn’t write this prayer, I am just sharing it with all of you. Please lift Pastor Saeed and all those who are dying and in prison because they are a Christian. Today I was reminded of these verses in my quiet time as I have been battling discouragement. It is over 3 years since the kids and I have seen Saeed. My daughter turns 9 in a few days and I can not believe that the last time she saw Saeed was when she was 5. I have had to leave my kids and travel advocating for my husband at a time when they need me the most. I am torn between staying and leading somewhat of a normal life for my kids and yet wanting to do all I can to get my husband out of the Iranian prison…to make sure he is not forgotten and he is not left behind. As the years drag on, there seems to be less and less attention to Saeed’s cause, less and less response and involvement with the prayer vigils and silence from our government (with more and more indication that Saeed is indeed left behind). The situations seems to be getting worse. Yet I can hear Jesus say that it will not end in death. That He is allowing everything to die down and not look very promising as with the story of Lazarus for “the Glory of God, that the Son of God may be glorified through it.” Jesus loved Mary and Martha “so, when he Heard that he (Lazarus) was sick, HE STAYED TWO MORE DAYS…” He stayed longer. Until every hope was gone. It was because of His Love for Mary and Martha that He waited. Today, you might be facing the same situation. You have given it all you have and things seem to be getting worse and harder. Jesus loves you, yet He is waiting. The waiting and allowing for the situation to get worse is so that the Glory of God would be revealed and that many lives would be saved! Don’t give up. I am not giving up. Let us continue to look to Jesus.